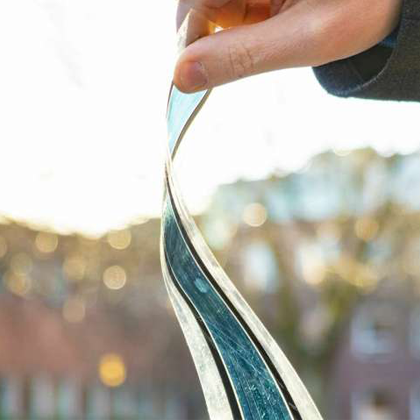 A polymer that would enable a doubling of energy efficiency of existing organic electronics has been developed, enabling a much wider use of the technology. Organic light emitting diode displays in smartphones are one example of an application for the existing polymers which are already on the market. However, with the new polymer, power recovery from a computer’s waste heat, textiles with electronics woven into them, and cheaper solar cells are possible, say researchers. What has held polymers back for their use in electronics is their poor conductivity. The new polymer is compatible with organic semiconductor manufacturing techniques and like those materials is also doped. Doping is when a small amount of a chemical is added to a material to change its properties. “We chose to look at a different type of polymer. We saw that this material allowed the transfer of two electrons to the dopant molecule,” said polymer science professor, Christian Müller, at Chalmers University of Technology in Sweden. This transfer of two electrons between the organic semiconductor and the molecule of dopant is double what is normally achievable for polymers. A gas or liquid dopant is added to a polymer during its manufacture to make it more conductive. Doping in organic semiconductors occurs through the redox reaction. A dopant molecule is given an electron by the semiconductor and the more of these molecules there are for the semiconductor to give electrons to, the higher its conductivity is. This process can also be used in a thermoelectric device which turns heat into current. Of the potential uses, therefore, one is making the thermoelectric technologies only used in space probes cheap enough for consumer electronics. “The thermoelectric devices [today] operate at 20% efficiency and the devices are so expensive they are only viable for space applications,” explained Müller. The devices are used to convert heat from a radioactive source onboard a space probe into electricity. “They are also cooling with it. So that is an added advantage,” he adds. Muller and his fellow researchers spent two years discovering the polymer and dopant that could transfer more electrons. While work continue to improve the production process for that organic semiconductor, his group is studying applications for the technology including electrically conducting textiles and organic solar cells. In the picture, the solar cell that can be seen was supplied by photovoltaic specialist Epishine. The research was funded by the Swedish Research Council, the Knut and Alice Wallenberg Foundation, and the European Research Council. Chalmers University of Technology was part of a consortium that included Sweden’s Linköping University, King Abdullah University of Science and Technology in Saudi Arabia, Imperial College London, Chemnitz University of Technology in Germany and the US colleges, the Georgia Institute of Technology and the University of California, Davis.